EPHONI has succeeded in four European calls which objectives are detailed below. Objectives : This project is at the intersection of photonics, RF signal processing and phononics, aiming to achieve an all-optical phononic circuit using coherent phonons as the state variable. The concept is based on cavity optomechanics (OM) to develop GHz- frequency in-chip phononic circuits for room temperature operation. The circuits will integrate OM-pumped phonon sources and detectors as well as phonon processing components (waveguides, splitters, memories, photonic RF signal processing) to process information with phonons outside the cavity. The project seeks to prove two concepts. One is the efficient generation of GHz to tens of GHz coherent phonons, coupling them efficiently into a waveguide, engineering their propagation with low losses and detecting them at room temperature. The other is the synchronisation of two or more self-sustained OM cavities, which relies on the integration of several phononic components. 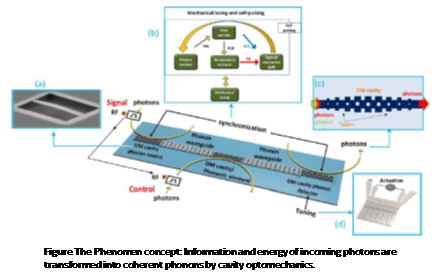 Phonon-based processing will enable on-chip synchronisation and transfer of information carried between optical channels by phonons, which could eventually serve as a future scalable platform for, e.g., practical information processing with phonons. Consortium members : Materia Nova (MANO) Belgique; Université de Mons (Be); Université de Gand (UGENT), Be; Centre Européen du Textile innovant (CETI), Lille; UPTEX, Lille; Ecole Nationale Supérieure des Arts et Industries du Textiles (ENSAIT), Roubaix; Hautes Etudes Industrielles (HEI), Lille, Université des Sciences et Technologie de Lille (USTL) IEMN, Lille. Objectives : The textile industry is a pillar of the regional economy of the Hauts-de-France region and Belgium. However, the sector has suffered a deep crisis related notably to the modernization of the productive apparatus and the competition of emerging countries. The objective of PHOTOTEX is to propose smart active textile materials (membrane, filament), able to adjust their reflectance in near and medium infrared (5-15 μm) according to the temperature or the humidity, thus allowing a better thermal regulation. The work will consist of studying the interaction of electromagnetic waves of a nanostructured photonic textile membrane / fiber in the MIR domain (5-15 μm), corresponding to the radiation of the human body. Figure : Control of the photonic radiations of the human body in the MIR. Consortium members : Institut des nanosciences de Paris (INSP), University Magdeburg (Ge), University Bremen (Ge), Université des Sciences et Technologie de Lille (USTL) IEMN, Lille. 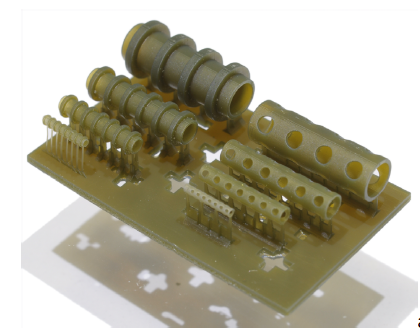 Objectives : In the context of phononic and acoustic metamaterial, the project aims at a new class of phononic crystals, Tubular Phononic Crystals (TPCs) and their application as Tubular Phononic Crystal Sensor, the Tubular Bell. The vision behind is a fundamentally new sensor concept for in-line monitoring of liquids in cylindrical structures like pipes (chemistry) or vessels (medicine). The physical challenge is formulation and physical description of phononic crystals created by radical change of phononic crystal geometry from 2D planar or 3D Cartesian with translational symmetry to 3D cylindrical with both translational and rotational symmetries. The engineering challenge is the ultimate change from chemical sensors determining properties at the interface to the analyte to a new class of sensors measuring volumetric properties of the analyte. 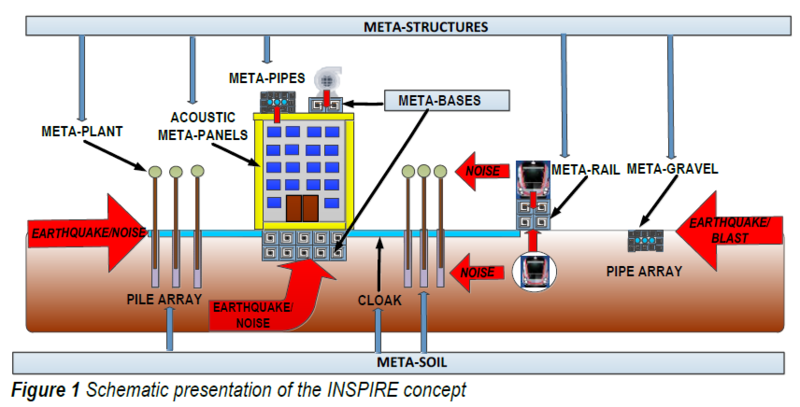 Objectives : INSPIRE aims to foster a new generation of holistic and novel soil-foundation-structure concept for the efficient protection of structures from all ground induced hazards, including earthquakes and all other sources of low-frequency noise and vibration excitations. INSPIRE mainly relies on recent innovative scientific and technological concepts, mainly developed within the broad concept of acoustic meta-materials. Non-academic partners : SNCF (Fr), Joint Research Center (It), TREVI (It), ADK (Greece), Isolgomma (It), Gantrex (Be), Baudyn GmbH (De).